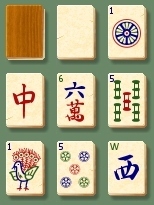 Why not play memory with Mah-Jongg tiles? Of course it's possible and it's fun. But if you're a beginner try another sets, this one is pretty hard.